People are being urged to have their say on a draft blueprint for the Melton borough which considers where 6,125 new homes should be built over the next 20 years. The plan will also consider employment land, transport infrastructure including an outer relief road for Melton, and other key improvements needed to support future growth. A 12-week public consultation on the draft Melton Local Plan (Emerging Options) will be launched on January 11. This will give people the chance to have their say on the preferred development strategy, draft policies and potential development site options which would guide the borough’s growth over the plan period (2011-2036). It’s anticipated the final version of the plan will be prepared and published in the late summer of 2016, having taken comments submitted during the forthcoming draft local plan consultation into account. There will then be a further six weeks of public consultation on the final ‘publication version’ of the plan before it is submitted for external examination by an independent planning inspector. It’s expected the local plan will be adopted by Melton Council by the summer of 2017. Among the key chapters and policies contained in the 187-page draft local plan concern where new homes should be built. It is suggested (under policy SS2 – development strategy) that 65 per cent of the 6,125 new homes needed to be built up until 2036 should be in Melton, with 35 per cent in the villages. Development required in Melton is proposed to be focused in two new large-scale ‘sustainable neighbourhoods’ to the north (NSN) and south (SSN) of the town. In terms of housing, the Melton north sustainable neighbourhood is proposed to provide 1,500 homes, as well as extra care housing to meet the needs of the ageing population and a permanent site for gypsies and travellers (at least three pitches). 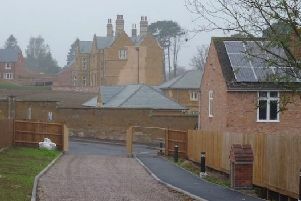 The draft plan document says: “The north sustainable neighbourhood will create a high quality residential development around the Melton Country Park and a new community hub adjacent to John Ferneley College, which will include a new primary school and small-scale economic development opportunities targeted towards business start-ups. The Melton south sustainable neighbourhood is aimed to provide 2,000 homes as well as extra care housing and a permanent gypsies/travellers site. Some 20 hectares of employment land would contribute to the borough’s economic growth, with a major expansion of the Leicester Road business park planned. New community facilities for residents would include a new primary school as part of a new ‘local centre’ provided off Dalby Road which is also envisaged to include a small parade of shops. A link road connecting the A606 to the A607 Leicester Road would form part of the Melton outer western relief road. In respect of the borough’s villages, the draft local plan sets out the number of homes proposed to be delivered in particular villages as well as maps showing potential development sites. The plan explains the council’s reasoning and processes involved in coming up with the options, with Bottesford, Asfordby, Long Clawson and Waltham considered to be the ‘most sustainable locations for growth outside Melton’ and accommodating 15 per cent of the borough’s housing needs up to 2036. Of these four villages, subject to review, it’s proposed that Bottesford should provide the lion’s share of housing (40 per cent – 368 homes). Asfordby is proposed for a 33 per cent share (303 homes), Long Clawson 16 per cent (147 homes) and Waltham 11 per cent (101 homes). So called ‘secondary rural service centres’ are proposed to cater for five per cent of the borough’s housing need up to 2036. These villages, each proposed to provide 50 homes through small allocations, would be Somerby, Croxton Kerrial, Frisby-on-the-Wreake, Stathern, Asfordby Hill and Wymondham. The draft plan emphasises that the council will support the preparation of neighbourhood plans, which many parishes are already working on, and their development proposals provided they are ‘consistent with the strategic objectives and proposals included within the local plan’. Melton Council leader Byron Rhodes said: “This draft local plan is for consultation. This isn’t the final decision so people shouldn’t get into a lather if elements of it don’t meet their expectations or approval. “To build no new homes is not an option. We have to build for the long-term prosperity and future of our borough. “The question is how many and where should they go? The amount needed up to 2036 is 6,125 homes. That means we’re going to have to hope we will get up to 300 homes a year built if we’re to catch up. “Much of this is going to be contentious, with people feeling their way of life is adversely affected by what’s being proposed, but other people will see the opportunities to live and work and enjoy life in the borough. You will be able to click on the Melton Local Plan Emerging Options (Draft Plan), fill in your contact details and then just work through the document, answering the questions you’re interested in. By providing a valid email address, the system will allow you to save your response and return to it. policy@melton.gov.uk or calling (01664) 502321. The consultation is set to launch on January 11 and will run until April 4.